You can peel the potatoes the day before, then cover with cold water and refrigerate until ready to cook. 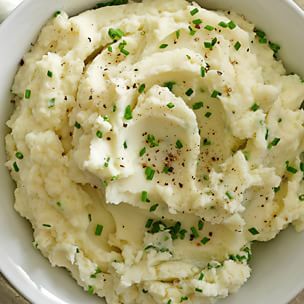 Alternatively, you can cook and mash the potatoes up to 2 days in advance. Let them cool to room temperature, then transfer to an airtight container and refrigerate. Just before serving, pour a thin layer of milk onto the bottom of a wide, heavy pot. Add the mashed potatoes, set the pot over medium heat and stir occasionally until the potatoes are hot. Put the potatoes in a large pot, add water to cover by 3 inches and generously salt the water. Bring to a boil over medium-high heat, reduce the heat to medium-low and simmer until the potatoes are tender when pierced, about 15 minutes. Drain well in a colander. Meanwhile, in a small saucepan, combine the cream, garlic, shallot, thyme sprig, rosemary sprig, bay leaf and peppercorns. Set over medium-high heat and bring to a simmer. Reduce the heat to medium and simmer until the cream is reduced to about 1 cup, 10 to 12 minutes. Strain the cream through a fine-mesh sieve and keep warm. Working in batches, pass the potatoes through a ricer into a large bowl. Add the butter, then gradually pour in the cream, stirring constantly until the potatoes are smooth and creamy. Stir in the chives and adjust the seasonings with salt and pepper. Serve immediately. Serves 8 to 10.